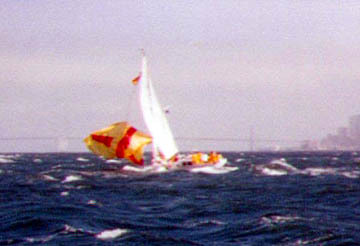 Spinnaker Precision Sewing behind the Mt. View West Marine store is an interesting all-women company that repairs sails and does industrial sewing. Embarrassingly, they know me well. When I walked in with my spinnaker bag, Annie, greeted me with, "Hi Alex, what did you rip this time?" At the first viewing, she said "Whew" then called over Silvia the master repairer saying "Wow, look at this!" Since both leech tapes had ripped off and were wound into the world's biggest tangled knot, it took awhile to untangle the spinnaker plus the French Sock we use, to assess the damage. Finally, we found out that our spinnaker was beheaded! The entire head down about two feet was severed and still inside the Sock; the rest was shredded in four different areas. Finally, Silvia said in a quiet, slightly quivering voice, "I can fix this ... but it's a spectacular!" golf-ball-size splotch, this intimidates other crew members when I ask them to go up to the foredeck to help. up. However, I suddenly felt we had run aground as boat speed dropped to almost nothing. 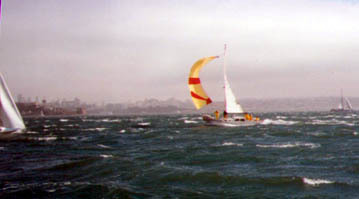 Before I could figure it out, my 14-year-old Stephanie, on her first race, observed, "Oh -- it looks like they've got the spinnaker under the boat." 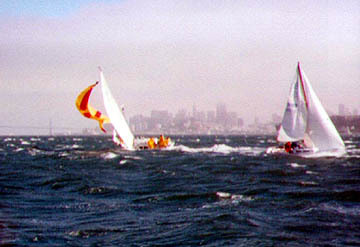 Yes, I learned boat speed drops dramatically when you drape your spinnaker across your keel. Funny I've never read this in any book. The rest is history ... and $250 of repairs. Come out to the next race and see my patched up spinnaker!